This entry was posted in bakeries, baking, cupcakes, desserts, food, pastries. Bookmark the permalink. Wow – that has to be the tackiest thing I’ve seen in a good long time. And that’s probably the most polite thing I can say about that, except that for $1000 you better believe I’d be taking that cake stand and everything around it that isn’t nailed down! One final thought before ending my rant: money cannot buy taste or should I say, taste buds in this instance. The most expensive and absolute best are terms that are mutually exclusive. The absolute best of something is highly subjective and very often can cost little or nothing at all… Another thing that money cannot buy? Class. ooh, that’s a good one. i never thought of that one!!! See? Burgers really are the devil..psh! Fascinating read. 🙂 Just dropped by to tell you I’ve nominated you for the versatile blogger award! You can swing by my entry about it to read up! Hi i think your blog is great, I nominated you for One Lovely Blog Award. Happy blogging! I am with you on the medium-rare ribeye and I am enjoying your blog! The civet cat also called the Cacomistle’s stomach enzymes and acids help make the coffee less bitter. I have heard it’s good. I am actually curious enough to try it. I’m sorry but I make cupcakes all the time and they are heaven and they cost me £5 for a batch, so no way am i spending 1000 for a single cupcake that i will have digested in a couple of hours. And did you say 5 weeks to make it? what is it? A construction building? I’m sorry but i don’t even spend half an hour decorating a cupcake. I’m gonna eat it!!!! Crazy rich people..can’t stand them. I think I would want the world’s finset pizza. Just think of all the awesome flavor combinations with fine cheeses and expensive cuts of meats. Ugh, I want some damn pizza now! But I have to agree with you that red velvet is one of the most disappointing flavors out there. I thought I was the only one that felt that way because when I do mention that, I always get a bunch of weird side eyes from non-bakers/chefs/cooks. Personally when I taste red velvet, all I taste is salt. (Am I the only one?). And I don’t know about the rest of that stuff, but organic strawberries definitely have a better taste as do MOST organic things. Though I think you can taste the best organic flavors when it comes to milk and eggs. 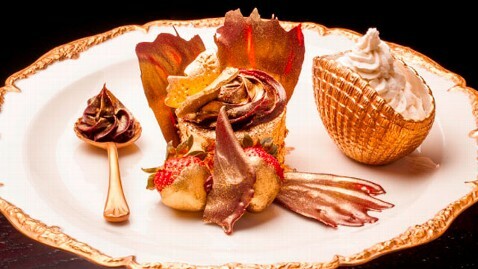 wow, that’s one gilded cupcake! I’m a sweet-tooth addict! And this is an interesting read! Along with the links attached following all the existing expensive ‘cheap’ food out there, this also remains to stand as ridiculous. Pay me, and I will eat it though! Reading this post makes me hungry too! I have had some pretty amazing vegan desserts that would be on the top of my list of what I would want to eat if I could eat anything. As far as the most expensive, I don’t know… maybe a really unusual cut of meat, like the most expensive Mangalitsa pork chop. As for what I would own the most expensive of, I wouldn’t go for a house or a car. I would go for a stereo sound system. I have a Bose cd player which is quite wonderful, but if I could be surrounded at all times by the best music sound system money can buy, that would be sheer ecstasy!